Ami ki ekhane bc547 use korte pari bf494 er poriborte? hey Arup, thats great! I remember building an FM circuit like that when I was around 12 years old too…but that was 30 years ago in the early 1980’s. I was amazed that it actually worked! It had a range of a kilometre or so. I took it to show the physics teacher at school, he had no idea how it worked but he was pretty impressed 🙂 Its good to see that guys like you are still experimenting with electronics. ETATE COIL NA DILE MW DHORBE TAI NA. Hi,it is the c1,c2 is trime capacitor? 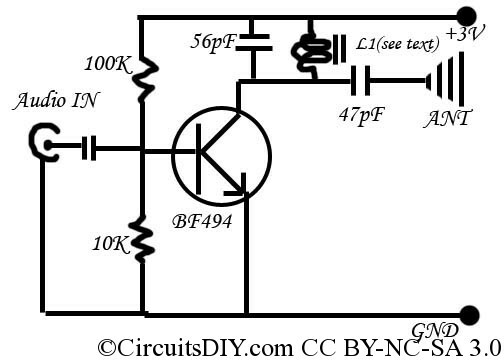 Can i use BC 548 instead of BF 494 transistor? Hi Arup can I use a variable coil and if I can, can I set the frequency with that variable coil?